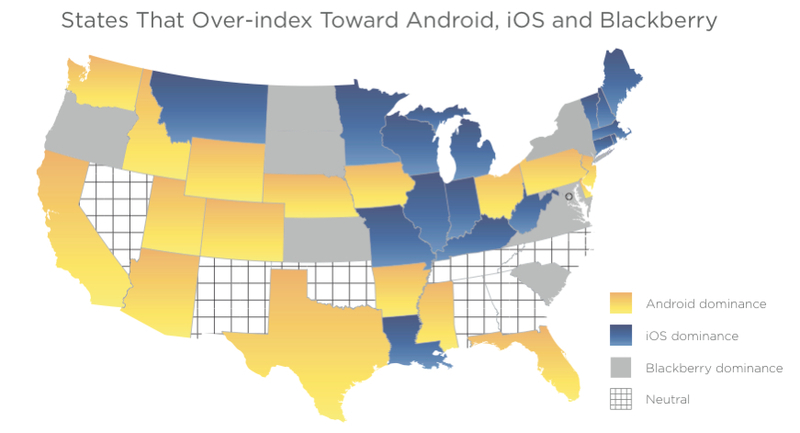 Which states click ads on which mobile platform? Jumptap, a mobile ad company, created the graphic above based on data from the 83 million unique users on its ad network, and on Friday it shared it in its monthly STAT report. The information doesn’t represent direct device or platform sales by state, but it does provide a decent overview of where different kinds of mobile devices are primarily being used. What would really put this graph over the top is if you could overlay a carrier density/coverage map. Keep in mind, folks, that this is for “ad clicks”! I don’t know about you, but I’ve never, ever clicked on an ad (well, perhaps once or twice in 10 years on a Macintosh, inadvertently) and never plan on starting now. This says something about gullibility and phone types! I am soooo embarrassed for Washington! Windows Phone 7. The Ross Perot of phones. I don’t know about the rest of the country, but I live in MS where Cellular South is the dominant provider (coverage EVERYWHERE). Bad thing is their phone selection is dismal and the best phone they have is Android. Pretty much everyone has an HTC Hero.